How is it possible to change Links look at the start screen? Why slot 1 and 2 has a different look? And why the golden-ring-Link is black/invisible? In the ZQuest Editor, use Quest->Graphics->Game Icons. The graphic (tile) is linked to the highest level of (Armour) Ring that Link has; and the tile bust be 4-bi (16-colour). Note that the internal 1st->5TH quests use hardcoded tile IDs for their icons. That behaviour is likely to change in 2.55, as the quest icons should be set by the current module. Could someone please kill this thread? It is the same one. There are 4 black squares. I don't know what I have to do. The squares stay black, whatever I do. I can change the CSet, so that I see tiles, but what then? I can't select a tile and the square stay black. I'd guess that your palette has black for its CSet 6 colours. IDK how you set that up, but I'd think that your Lv3 ring CSet offset is wrong. In the Item Editor, this is the Link Sprite Palette attribute on armour ring class items. Post a link to download the quest file that you are editing, and I'll have a look. Last edited by ZoriaRPG; 12-02-2018 at 02:11 AM. Oh my... Where did you find this base quest file? The tileset is from ZC <= 1.90 .... ?! I can't promise that it won't have any other serious defects, but I patched in the current palette and tiles, and I fixed the quest icons for you. Unfortunately, it won't be set up for any of the new tiles, and splicing in the current combo table isn't an option. It'd probably be better to re-create your maps using the current base files, to avoid issues, but at least this will remedy your immediate concern. You just won't have any of the new graphics that have been added to the base ZC tileset over the last seventeen years. P.S. You may want to rethink the Magic-Octorock spam on the overworld, too. Other than that, it looks to be a fun little dungeon romp, en Deutsche. Last edited by ZoriaRPG; 12-02-2018 at 10:46 AM. 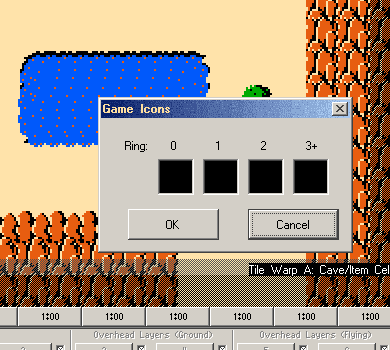 The colors used for select screen icons are not the same ones used for Link in-game. In Quest > Graphics > Palettes > Sprites > 1, CSets 9-12 are the ones used on the select screen. You can press C and V to copy and paste CSets. You can even copy them from the main palette to the extra palettes that way. Isn't it possible to convert it in any way? I've tryed to export my maps, dmaps, etc. and import it in a new file, but it doesn't work. Animated water and many other things would be grate. Magic-Octorock Spam? This is the Magic-Octorock reduced version! Ok, the corner you address is the one that is dangerous. Ganons palace is there. The king of the underworld rams his henchmen around. Maybe a problem without the mirror shield, a boomerang and the red ring, but this is The Legend of Zelda and NOT a little girls birthday party. In the non-Ganon-area are almost no Magic-Octorocks, except to guard the magic sword and the master sword/golden arrow. But apart from that: Thank you for your help. Your German (or your Google translation) is just as bad as my English. You can add combos after a specifc position. I just couldn't automatically replace all of your combo table, as the flip values differ from 1.90->2.10 (and above). 1. Determine the lowest used combo (with no combos after it!!) in your combo table, and make a note of its ID. 4. 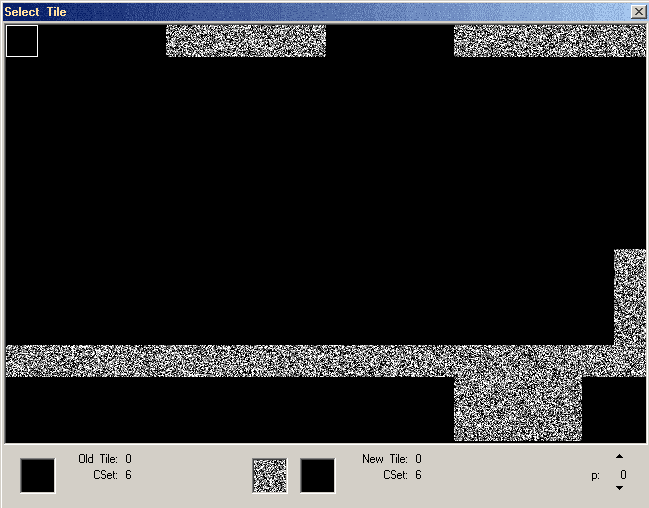 Select the file 1st.cmb in the dialogue. 5. ZQuest should append the new combos to your combo table, and because I pre-loaded the tileset and the palettes, they should instantly work, and be available. 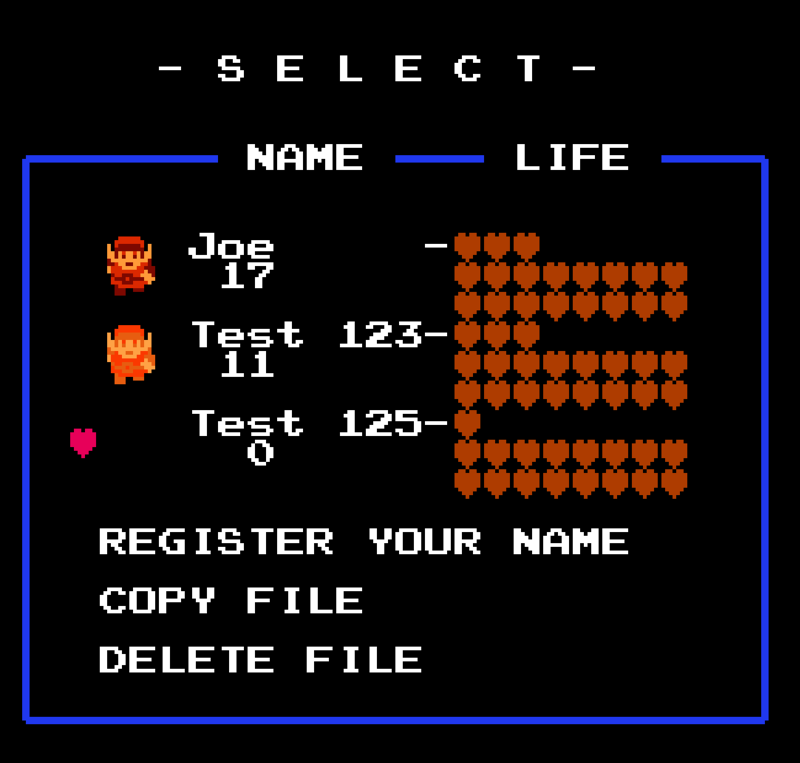 Coincidentally, I added Link's tile on the file select screen to the modules yesterday: Coincidentally, because James needed it for the Demo Series modules., and it has been on my list for a while. I probably would have delayed it a bit, but the name entry screen graphics were garbled in his module, because the base tile placement is offset from 2.50 specs, using the old 1.84-era format! I need to do some further refinement, so that the tile works without interfering with custom quest icons, and some other things. The behaviour on the name entry screen is a bit quirky. Anyway, I mentioned this because I have yet to add a modifier to the the cset value, when the module has a manual tile override. At present, the tiles default to csset 9--where the sprite palette data loads, IIRC--but the module can use any cset that it wishes. 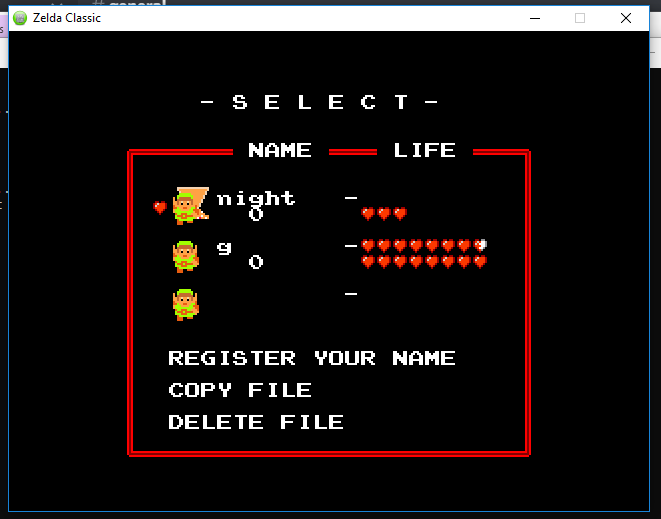 I'll need to add some way to read Link's modified colour to the new routine, with an option in the module to suppress that. You can set the frame tile and cset, Link's tile and cset, the cursor tile and cset, and up to two decoration tiles (and csets each), for up to ten (internal) quests in the nodule package. Last edited by ZoriaRPG; 12-03-2018 at 10:54 AM. 1. The lowest used combo is 192. 2. ????? Are you sure that you mean Quest->Import->Combos? I can't import there anything. You mean File->Import->Combo Table?? 5. Maybe I'm too stupid for that. You have my qst.-file. Could you please try it? P.S. My German is somewhat degraded, and I primarily read the language infrequently, but en Deutsche is slang (phonetic 'en') of sorts, over here. Maybe it is a german slang IN GERMANY, but I am from Austria (Salzburg, on the german/bavarian border). This is the land with the mountains, not with the kangaroos. In Austria we have the problem that a West Austrian hardly understands an East Austrian when he speaks in dialect. And vice versa. Damned dialects. The most often spoken sentence: What did you say? PS: Your tutorial doesn't work, but at least I have since yesterday an animated waterfall. Oh, rats. I'll have a look, but I may have remembered the behaviour here wrongly. You need to insert blank combos first, to create the offset, and the starting value is the combo page, not combo ID. EDIT: There's sadly no way to automate this. I'd need to do a lot of manual reconstruction, using your ma;d in the newer tileset. If I have time, I'll try to do that, but even basic things such as dungeon doors--hardcoded tiles in 1.90--now need combos. I'd need to do massive amounts of reconstruction. I can possibly wotk on features for ZQuest, tp insert raw combos or tiles, but that's another matter. Last edited by ZoriaRPG; 12-03-2018 at 02:18 PM.